Spring Rummage Sale – April 16! 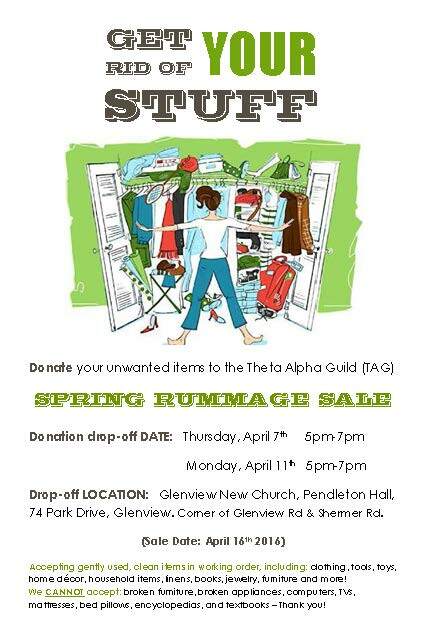 The Glenview New Church is holding our annual Rummage sale on April 16th from 8 am – 2 pm. It’s time to clean out your closets and donate your unused items. We are accepting gently used, clean items in working order, including: clothing, tools, toys, home décor, household items, linens, books, jewelry, furniture and more! We CANNOT accept: broken furniture, broken appliances, computers, TVs, mattresses, bed pillows, encyclopedias, and textbooks. We will gladly accept your donations on Thursday April 14th 9am – 9pm and Friday April 15th 9am – 5pm. In addition, The Rummage Sale Organizers and Theta Alpha need your help! Please consider volunteering for a slot on the day of the sale, Saturday April 16th or during the drop-off times on Thursday or Friday prior to the Sale to help sort and price. We appreciate your support in any and all areas!